To Cite: Najafi N, Movahed K, Barzegar Z, Samani S. The Effect of Ventilation by Window Opening on Stress, Anxiety, and Depression of Female High School Students, Int J School Health. Online ahead of Print ; In Press(In Press):e87038. doi: 10.5812/intjsh.87038. Background: The mental and physical comfort of students in the classroom is very important because it affects students’ learning. The structure of negative emotional states, including stress, anxiety, and depression is influenced by the building environment and its physical features. Objectives: The present study aimed to survey the relationship between ventilation by window opening and female student’s stress, anxiety, and depression in high school classrooms. Methods: The current study was conducted as a quasi-experimental method, using pre-test and post-test with the control group. Statistical population of this study was female students studying at Shiraz high schools during 2016 - 2017. A total of 384 students were selected randomly using Cochran’s formula for participation in the study. The students in 14 classrooms were divided into two groups of intervention and control. The pre-test was used for assessing stress, anxiety, and depression in DASS-21 questionnaires. The intervention group was then allowed to improve the air quality for 6 weeks by opening the window in the classroom. However, this discretion was not given to students in the control group. After 6 weeks of post-test, DASS 21 questionnaire was used. Results: The mean stress score in the intervention group was 20.36 ± 4.326 at pre-test and 19.91 ± 5.162 at post-test and in the control group was 20.28 ± 5.348 at pre-test and 19.91 ± 5.162 at post-test. The mean anxiety score in the intervention group was 21.15 ± 4.705 at pre-test and 18.55 ± 4.673 at post-test and in the control group was 19.12 ± 5.272 at pre-test and 18.92 ± 5.0 at post-test. Also, the mean depression score in the intervention group was 18.29 ± 4.878 at pre-test and 18.53 ± 4.750 at post-test and in the control group was 17.83 ± 5.501 at pre-test and 17.28 ± 5.375 at post-test. Ventilation by window opening could significantly decrease the level of stress (P < 0.001) and anxiety (P < 0.001) but no significant difference was observed in depression (P = 0.067). Conclusions: Ventilation by window opening in the classroom could reduce the stress and anxiety of female high school students in eight weeks, but did not affect the level of depression. Mental disorders have increased exponentially in recent decades and led to serious public health problems (1). In particular, the prevalence of behavioral and mental disorders among high school students has been reported in several studies (2-5). Students’ mental health is an important concern since it affects many factors such as academic performance, concentration, fatigue, learning, and absenteeism (6). For this reason, the identification of factors affecting the development and increase of these disorders is of interest to mental health researchers. Stress, anxiety, and depression are negative emotions that are prevalent among students. Negative emotions not only have negative effects on mental health but also affect students’ academic achievements. The World Health Organization (WHO) reported that depression affects people of all ages and lifestyle and causes distress and interferes with a person’s performance at quotidian tasks (7). The importance of negative side effects related to stress, anxiety, and depression necessitates the investigation of this issue among students (8). Several economic, social, and physical environmental factors influence human mental health that building environment is one of them. The physical environment affects negative emotions and mental disorders (9). Environmental psychology helps to identify the factors affecting these emotions (10). The building environment includes several determinates such as housing, neighborhood, plants, the convenience of the facility, and the pattern of land use, which affects human mental health individually and collectively. These dimensions not only do they effect on mental health directly but also the features of the building environment determines user’s behavior (11). Recent cross-sectional studies in educational buildings have documented that physical features of the classrooms and its interior design could affect student’s psychological responses such as stress, aggression, and happiness (12-14). Several factors might affect the quality of the indoor environment such as air pollution, noise pollution, visual contamination, odor, light, air condition quality and ventilation, thermal comfort, and chemical pollutions (15). Thermal comfort is an environmental feature that affects human mental health (16). Air temperature, relative humidity, air velocity, clothing, and metabolic rate affect thermal comfort (17). Although thermal comfort is important in all building applications, indoor thermal comfort is a matter of immense concern for students in the school as they spend a major portion of their education in the classrooms (18). A systematic review study showed that hot weather was one of the factors influencing depression among students (19). Humans use different adaptive opportunities to control thermal conditions, e.g. opening the windows, changing clothes, and using curtains. These actions use to achieve and maintain indoor thermal comfort. Human at home or other personal environments adjust their own thermal environment but public spaces may not be able to provide all users thermal satisfaction. One effective solution to reduce indoor air temperature in hot seasons and improve the air quality is window opening that was studied in several researches among workers in the offices or students and staffs in the educational buildings such as schools and universities (20). Having self-control in setting thermal environmental conditions could improve occupant’s tranquility and comfort as Zhou et al. (21), indicated in an experimental study. Regarding the importance of the effect of air quality on mental health, this study seeks to investigate the effect of ventilation by window opening on negative emotions, including stress, anxiety, and depression among female high school students. The method of this study was quasi-experimental design with pre-test, post-test, and control group. Statistical population of this study was female students studying at Shiraz high schools during 2016 - 2017. Cochran’s sample size formula was used for estimating the sample size (N = 384). In order to select schools and classrooms, multi-stage cluster sampling was used. A district was selected randomly from four educational districts of Shiraz. Then two schools were selected randomly from all female high schools in the selected district. In the next step, 14 classrooms were randomly selected among the two selected schools. In order to have the groups with equal sizes, random allocation rule was applied to randomize the students. The students in 14 classrooms were divided into two groups of intervention (N = 192) and control (N = 192). By reviewing students’ health records at the school, students who did not have a specific respiratory disease participated in the study. The pre-test was used for assessing stress, anxiety, and depression in DASS-21 questionnaires. The intervention group was then allowed to improve the temperature and ventilation by window opening for 6 weeks in the classroom. However, this discretion was not given to students in the control group. After 6 weeks of post-test, DASS-21 questionnaire was used. Intervention process was conducted from April to May 2017. DASS-21 was developed by Lovibond and Lovibond and also has been used widely in clinical samples to screen the symptoms at different levels of depression, anxiety, and stress. DASS-21 survey included the 21 questions: Depression (7 states), Anxiety (7 states), and Stress (7 states) self-report scales that measure these dimensions by 21 states. Answers were reported on a four-point Likert scale (0 - 3). Response option from 0 (did not apply to me at all), 1 (applied to me to some degree, or some of the times), 2 (applied to me to a considerable degree), 3 (applied to me most of the times) considered for each state. The higher the score the more severe emotional distress was (22). The findings show that the DASS-21 has psychometrically good reliability and validity. Also, the validity of this questionnaire was investigated by Samani and Joukar (23) in Iran and reported good internal consistency and construct validity (24). Handheld CO2 meter (Carbon Dioxide detector) AZ-7755 was used to measure CO2 concentration. The CO2 measuring range is 0 - 9999 (ppm) and the accuracy of the device is ± 50 (ppm) ± 5%. Statistical package for social science (SPSS) Version 21.0 was used to analyze the data. Mean and standard deviation as a descriptive statistical was used to analyze demographic data. Also, the effect of ventilation by window opening on stress, anxiety, and depression were analyzed with ANCOVA analysis. This article is approved by the Ethics Committee of the Islamic Azad University. Also, written informed consent was obtained from students’ parents. The study sample size consisted of 384 female students at Shiraz high schools. The mean age of the students in the intervention group was 17.12 years (SD = 0.54) and in the control group was 17.41 years (SD = 0.45). All of the participants (100%) in both groups were educated at the university. The average of monthly family income in both groups was between 20 - 30 million Rials. In each group, none of the students had a history of specific mental illness. There was no significant difference in the prevalence of overweight or obesity between the intervention group (7.1%) and control group (6%). The mean stress score in the intervention group was 20.36 ± 4.326 at pre-test and 19.91 ± 5.162 at post-test and in the control group was 20.28 ± 5.348 at pre-test and 19.91 ± 5.162 at post-test. The mean anxiety score in the intervention group was 21.15 ± 4.705 at pre-test and 18.55 ± 4.673 at post-test and in the control group was 19.12 ± 5.272 at pre-test and 18.92 ± 5.0 at post-test. Also, the mean depression score in the intervention group was 18.29 ± 4.878 at pre-test and 18.53 ± 4.750 at post-test and in the control group was 17.83 ± 5.501 at pre-test and 17.28 ± 5.375 at post-test. In order to investigate the effects of ventilation by window opening on stress, anxiety, and depression of the students, ANCOVA analysis was used. According to the results, window opening ventilation could significantly decrease the level of stress (P < 0.001) and anxiety (P < 0.001) but no significant difference was observed in depression (P = 0.067). 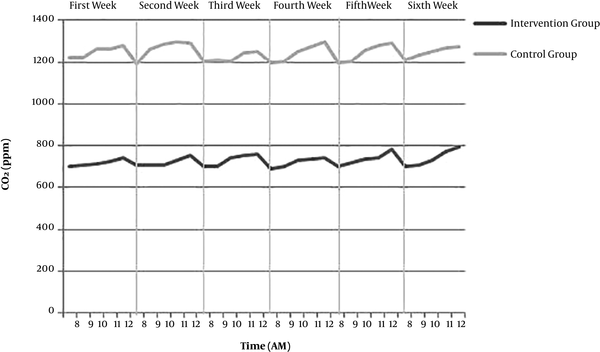 By comparing the CO2 concentration, Figure 1 showed that ventilation by window opening during 6-week intervention significantly improved the classroom indoor air quality. This study aimed to survey the association between ventilation by window opening and negative emotions, including stress, anxiety, and depression of female high school students by studying CO2 levels in the classrooms over six weeks. Is CO2 a good indicator of indoor air quality in classrooms? Chatzidiakou et al. answered this question. Overall, indoor CO2 levels were a useful indicator of indoor investigations (25). The present study found that by natural ventilation of the classroom, the temperature was reduced by opening the windows and reached the optimum temperature. Stress and anxiety were reduced in conditions of natural ventilation and favorable temperatures, which was consistent with some studies (26-29). According to the finding of a study conducted in the workplace, good ventilation and room temperature reduces stress and increases productivity in workers (26). Also, chemical elements of the air manufacturer (such as ozone) and poor ventilation significantly affected the stress level of females participating in the study (27). In line with the results of this research, one of the sources of stress reported among conference interpreters in their job setting was poor ventilation as a physical environmental factor (28). Furthermore, office workers experienced stress in offices because of sick building syndrome, especially poor ventilation (29). Contrary to the hypothesis, depression was not associated with ventilation by window opening and temperature reduction in our population. This finding may in part be a result of methodological differences between studies, especially the duration of the intervention that was 6 weeks. For example, Lan et al. surveyed usual task work and neuro-behavioral exam during 30°C as a warm thermal condition and 22°C as a neutral thermal condition. According to the physiological tests, negative mood such as depression was reported when the thermal condition was warm and air quality was undesirable (30). The predictive models estimated that average indoor CO2 levels during a teaching day should be limited to below 1000 ppm for the coarse fraction and 1200 ppm for the ﬁne fraction to ensure annual mean exposure below WHO 2010 guidelines. Overall, evidence indicates that limiting CO2 to 1000 ppm, which is lower than current guidelines, may improve indoor air quality in classrooms (25). According to the present study, CO2 levels in the control group was more than 1200 ppm and below 800 ppm in the intervention group during 6 weeks, which indicated the positive effect of ventilation by window opening. There were a number of limitations to the present study. Due to the fact that Shiraz located in a warm and dry climate, the need for air ventilation in the warm seasons is felt more than mild or cold seasons. This study was conducted in April and May, which is the last two months of education in the academic year. However, it is recommended that the study should be carried out in the warm months of the year. Maybe the changes in the negative emotions are more perceptible than the results of the present study. Also, measuring negative emotions were exclusively self-reported and might have been affected by self-report bias. It is recommended that the effect of natural ventilation by window opening should be investigated on male students and in other climate areas in future studies. According to the results, there is a substantial potential to reduce indoor pollution levels in the classrooms with simple cost-effective methods such as ventilation by window opening. Natural ventilation in the classroom reduced female high school student’s stress and anxiety, but did not affect their depression. It seems that 6 weeks was not enough time to change the level of depression, and longer period of time was needed to display the depression as a common negative emotion among students. Many schools do not have standardized mechanical air conditioning systems because of the limited funding, and due to the effects of air ventilation and the appropriate temperature on students’ stress and anxiety, thus it is recommended to use natural ventilation. The present study recommended that long-term investigations of pollutants known to affect health are routinely performed in schools and when necessary, remedial measures are introduced. Future studies could examine the effects of natural ventilation and the concentration of CO2 in the classroom on academic performance, learning, fatigue, and other negative emotions, such as violence among students. Despite the limitations of school selection and sample size, ﬁndings may assist stakeholders, architects, engineers, and school personnel to take better informed decisions on school building design, retroﬁtting, and maintenance. Actually indoor air quality investigations in school buildings should be part of the standard requirements of building regulations. This article is extracted from the Ph.D. thesis entitled “Codification a model about effects of thermal comfort on the behavioral reaction of female high school students” that was written by the first author under the supervision of the second author and the advisory of the third and fourth authors. Authors' Contribution: Najmeh Najafi and Khosro Movahed conceived of the presented idea. Najmeh Najafi and Siamak Samani performed the analytic calculations. Khosro Movahed, Zahra Barzegar and Siamak Samani supervised the findings of this work. All authors discussed the results and contributed to the final manuscript. Ethical Approval: This article is approved by the Ethics Committee of the Islamic Azad University. Funding/Support: Research has been conducted on personal expenditure. Patient Consent: Written informed consent was obtained from students’ parents. 1. Nelson B, McGorry PD, Wichers M, Wigman JTW, Hartmann JA. Moving from static to dynamic models of the onset of mental disorder: A review. JAMA Psychiatry. 2017;74(5):528-34. doi: 10.1001/jamapsychiatry.2017.0001. [PubMed: 28355471]. 2. Deb S, Strodl E, Sun J. Academic stress, parental pressure, anxiety and mental health among Indian high school students. Int J Psychol Behav Sci. 2015;5(1):26-34. doi: 10.5923/j.ijpbs.20150501.04. 3. Dupéré V, Leventhal T, Dion E, Crosnoe R, Archambault I, Janosz M. Stressors and turning points in high school and dropout: A stress process, life course framework. Rev Educ Res. 2015;85(4):591-629. doi: 10.3102/0034654314559845. 5. Li D, Sullivan WC. Impact of views to school landscapes on recovery from stress and mental fatigue. Landscape Urban Plan. 2016;148:149-58. doi: 10.1016/j.landurbplan.2015.12.015. 6. Gaillard AW. Concentration, stress and performance. In: Szalma JL, Hancock PAA, editors. Performance under stress. CRC Press; 2017. p. 75-92. 7. World Health Organization. Depression and other common mental disorders: Global health estimates. 2017. 8. Doom JR, Haeffel GJ. Teasing apart the effects of cognition, stress, and depression on health. Am J Health Behav. 2013;37(5):610-9. doi: 10.5993/AJHB.37.5.4. [PubMed: 23985283]. [PubMed Central: PMC5860662]. 9. Evans GW. Environmental stress. United States of America: CUP Archive; 1984. 10. Gifford R. Environmental psychology: Principles and practice. Colville, WA: Optimal books; 2007. 11. Firdaus G. Built environment and health outcomes: Identification of contextual risk factors for mental well-being of older adults. Age Int. 2016;42(1):62-77. doi: 10.1007/s12126-016-9276-0. 12. Najafi N, Movahed K, Barzegar Z, Samani S. The effect of thermal comfort on stress in female high school students. Int J School Health. 2018;5(3). doi: 10.5812/intjsh.67539. 13. Najafi N, Movahed K, Barzegar Z, Samani S. Environmental factors affecting students’ stress in the educational environment: A case study of shiraz schools. Int J School Health. 2018;5(2). doi: 10.5812/intjsh.67153. 14. Najafi N, Keshmiri H. The relationship between classroom indoor plants and happiness of female high school students. Int J School Health. 2019;6(1). doi: 10.5812/intjsh.82072. 15. Mendell MJ, Heath GA. Do indoor pollutants and thermal conditions in schools influence student performance? A critical review of the literature. Indoor Air J. 2005;15:27-32. 16. Coccolo S, Kämpf J, Scartezzini JL, Pearlmutter D. Outdoor human comfort and thermal stress: A comprehensive review on models and standards. Urban Climate. 2016;18:33-57. doi: 10.1016/j.uclim.2016.08.004. 17. Fanger PO. Thermal comfort. Analysis and applications in environmental engineering. Copenhagen: Danish Technical Press; 1970. 18. Zomorodian ZS, Tahsildoost M, Hafezi M. Thermal comfort in educational buildings: A review article. Renew Sustain Energy Rev. 2016;59:895-906. doi: 10.1016/j.rser.2016.01.033. 19. Jardim MHDAG, da Silva Junior GB, Silva RB, Alves MLSD, Branco JGDO, Dos Santos PDS. A systematic review of depression in university students. Int J Sci Res. 2018;6(12). 20. Rijal HB, Humphreys MA, Nicol JF. Development of a window opening algorithm based on adaptive thermal comfort to predict occupant behavior in Japanese dwellings. Japan Architect Rev. 2018;1(3):310-21. doi: 10.1002/2475-8876.12043. 21. Zhou X, Ouyang Q, Zhu Y, Feng C, Zhang X. Experimental study of the influence of anticipated control on human thermal sensation and thermal comfort. Indoor Air. 2014;24(2):171-7. doi: 10.1111/ina.12067. [PubMed: 23980928]. 22. Lovibond PF, Lovibond SH. The structure of negative emotional states: comparison of the depression anxiety stress scales (DASS) with the Beck depression and anxiety inventories. Behav Res Ther. 1995;33(3):335-43. doi: 10.1016/0005-7967(94)00075-U. [PubMed: 7726811]. 23. Samani S, Joukar B. [A study on the reliability and validity of the short form of the depression anxiety stress scale (DASS-21)]. J Soc Sci Hum Shiraz Univ. 2007;26(3):65-77. Persian. 24. Asghari A, Saed F, Dibajnia P. Psychometric properties of the depression anxiety stress scales-21 (DASS-21) in a non-clinical Iranian sample. Int J Psychol. 2008;2(2):82-102. 25. Chatzidiakou L, Mumovic D, Summerfield A. Is CO2 a good proxy for indoor air quality in classrooms? Part 1: The interrelationships between thermal conditions, CO2 levels, ventilation rates and selected indoor pollutants. Build Serv Eng Res Technol. 2015;36(2):129-61. doi: 10.1177/0143624414566244. 26. Moloney C. Workplace productivity and LEED building. 2012. 27. Fiedler N, Laumbach R, Kelly-McNeil K, Lioy P, Fan ZH, Zhang J, et al. Health effects of a mixture of indoor air volatile organics, their ozone oxidation products, and stress. Environ Health Perspect. 2005;113(11):1542-8. doi: 10.1289/ehp.8132. [PubMed: 16263509]. [PubMed Central: PMC1310916]. 28. Cooper CL, Davies R, Tung RL. Interpreting stress: Sources of job stress among conference interpreters. J Cross Cult Interlang Commun. 1982;1(2):97-108. doi: 10.1515/mult.1982.1.2.97. 29. Letz GA. Sick building syndrome: Acute illness among office workers-the role of building ventilation, airborne contaminants and work stress. Allergy Asthma Proceed. 1990;11(3):109. 30. Lan L, Wargocki P, Wyon DP, Lian Z. Effects of thermal discomfort in an office on perceived air quality, SBS symptoms, physiological responses, and human performance. Indoor Air. 2011;21(5):376-90. doi: 10.1111/j.1600-0668.2011.00714.x. [PubMed: 21306437].